Sleep, sound sleep, is good but it must be moderate. Four to five hours is sufficient for good health but it must be undisturbed by dreams. To have a sound sleep, the best way is to accustom yourselves to rise at night and not to go to sleep again after you have once been awakened out of your sleep. Suppose you went to sleep at 8 P.M. and awaken at 1 A.M. for some reason – either for calls of nature or just abruptly. After you are once fully conscious and awake, do not go back to sleep again. Keep awake. 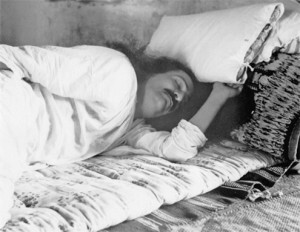 Either meditate between 4 to 6 A.M., for that is the best time for meditation; or go for a walk, or read, even if you are awake at 11 P.M. having slept at 8 P.M. and only get two or three hours of sleep. Being once awake and conscious from sleep, do not go back to sleep again, for that is injurious to health. Three hours at least must pass between your awakening from sleep and your going to sleep again; although if sleep is not taken, it would be still better. This habit of not going to bed again after the first break of sleep, though a little troublesome in the beginning, will eventually give good results of enjoying a perfectly sound sleep undisturbed by dreams, a most essential and invaluable factor in preserving good health.